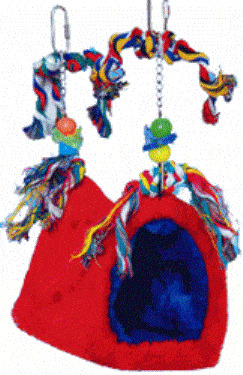 Snuggling Soft Hut for your pet bird! Birds love to hide, especially in the evening. This Hide out Hut is very plush and well-made, with acrylic inserted into the base for stability, durability and the safety of Your Pet. This protects the hideout From collapsing. This is not made with cardboard like others on the market!! Attached toys and colorful things to attract and entertain your birds.